← Vacation – blog closed. 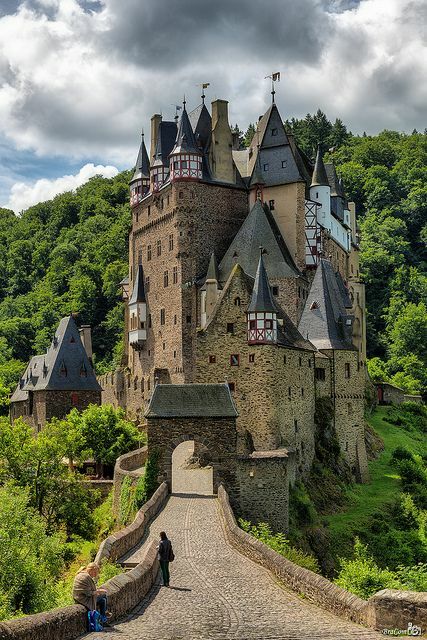 Publicat pe 4 august 2014	de Cristi M.
Eltz Castle is a medieval castle nestled in the hills above the Moselle River between Koblenz and Trier, Germany. It is still owned by a branch of the same family that lived there in the 12th century, 33 generations ago. The Rübenach and Rodendorf families’ homes in the castle are open to the public, while the Kempenich branch of the family uses the other third of the castle. The Palace of Bürresheim (Schloss Bürresheim), the Castle of Eltz and the Castle of Lissingen are the only castles on the left bank of the Rhine in Rhineland-Palatinate which have never been destroyed. Acest articol a fost publicat în Photos / Quotes și etichetat Castle of Eltz, Eltz Castle, Eltz Castle Germany, germany. Pune un semn de carte cu legătura permanentă. 2 răspunsuri la Eltz Castle, Germany.